Electro Optical Components Inc.: Genicom has developed a compact digital UV sensor. The GaN sensor measures UV only, blocking visible light. It has 16 bit resolution, programmable gain and integration time. 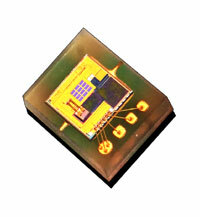 This low cost, compact UV sensor comes in a tiny SMD COB package (2.0 x 2.3 mm), great for portable applicaions. Applications for this include cellphones, wearable devices, watches, weather stations, cycle navigation gaming accessories and IoT products. -Light, Brightness, luminosity | -Optical and radiation | -Sensor technologies / Measurement principles | -Optical, Optoelectronic, Photoelectric | All articles | Electro Optical Components, Inc.